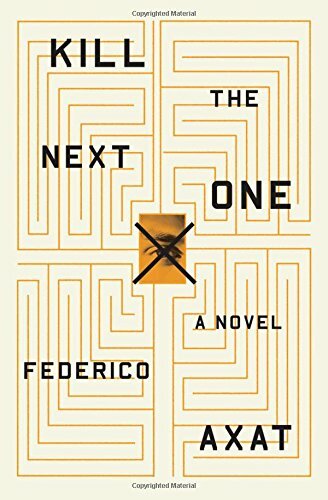 In this superb translation of Kill the Next One, Argentinian author Federico Axat invites the reader to solve a most original and convoluted tale of suspense. Ted McKay has an enviable family and every trapping of success. Yet the book opens with him holding a gun to his temple. The doorbell rings. A stranger has a proposition: Why not kill two deserving individuals before offing himself? The first would be a murderer who had mistakenly escaped justice, the second a terminally ill individual like himself. To Ted the logic of “the Organization’s” suicide chain makes perfect sense. “He wasn’t even in favor of the death penalty,” but wouldn’t it be easier for the families to cope with murder than with suicide? And yet when Ted commits the arranged murders the crime scenes feel disturbingly odd. He recognizes people and locations he shouldn’t. His targets know him by name. Familiar mementos turn up at the scenes. Axat has a talent for keeping dramatic tension on the rise. Nothing in this story is as it seems. Ted, the police, the gaggle of psychiatrists, and the families involved in this twisted adventure all begin to question the nature of reality. They begin to question themselves. Everything once known for certain becomes shrouded in doubt. Recurring dreams, nightmares, and chess games constitute part of the plot. Sometimes it is hard for readers to distinguish fantasy from reality, and the appearance of the Lavender Mental Hospital turns muddy waters even more turbid. Time sweeps back and forth over the course of decades. Long ago events echo in the now until finally the past catches up with the present. Ted clutches to a talisman from the past, a lucky horseshoe, throughout these jarring events. Just when readers think they have a grasp on what’s going on, Axat pulls a Roshomon effect. Parts II and III of the novel repeat scenes we already know from changed points of view. The repetitions echo the repeating cycles in Ted’s psychotherapy. We begin to question whether Dr. Laura is his advocate or malign. Kill the Next One is a thriller that makes others fade. Well-drawn characters, a devilish plot, and first–-ate storytelling make this an emotional mystery that satisfyingly resonates at the same time that it disturbs.